I put this in at church in memory of someone very special that died . the church members and family of Ethal love this. thanks for helping find the right thing to put up to pay my respects to her. I brought this to remember my husband at his grave site. We live in two different states now and I can't visit as often as I like. Hopefully, it will last a few months. These are pretty nice. The white is very white. I'm going to paint the crosses some other color than white. Other then that pretty nice piece for the money. Love the crosses because of the 3 prong stakes! The other cross I order I loved to but they had 2 stanted stakes on them and hard to push in the ground. It cracked the end of the crosses. Now slowly I will have to replace them. I was very careful pushing it in the ground! To honor a long-dead relative. My son would have loved it. I needed a marker for my Uncles grave. I needed a temporary marker for my daughters grave. 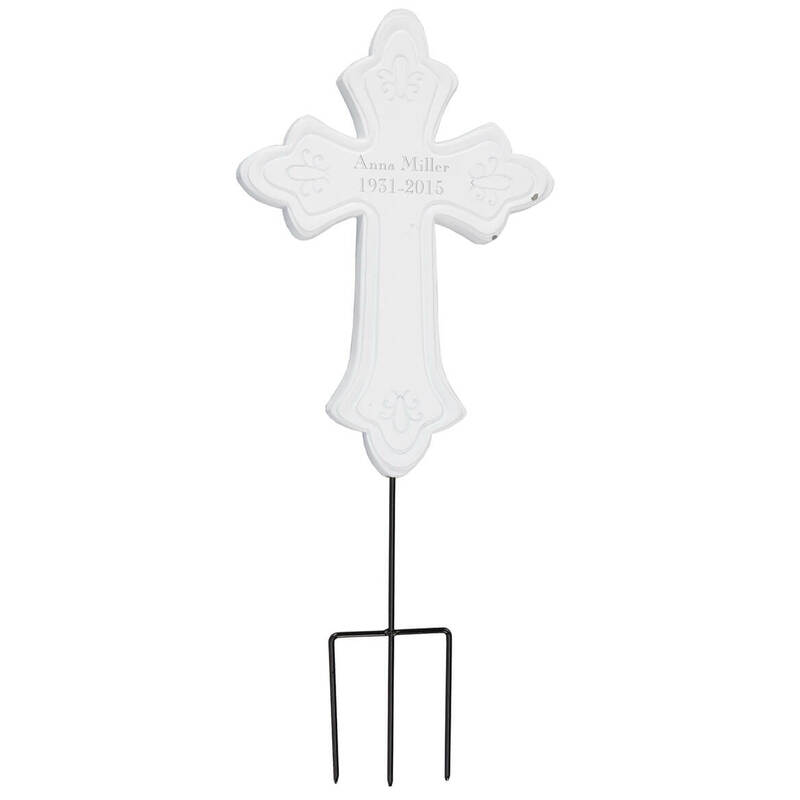 I wanted something to put as grave markers for our pets and I think this will work perfectly. For my mothers resting place a added touch of her faith in GOD . Can't afford a stone memorial right now. My son was a still birth and was never given a name. 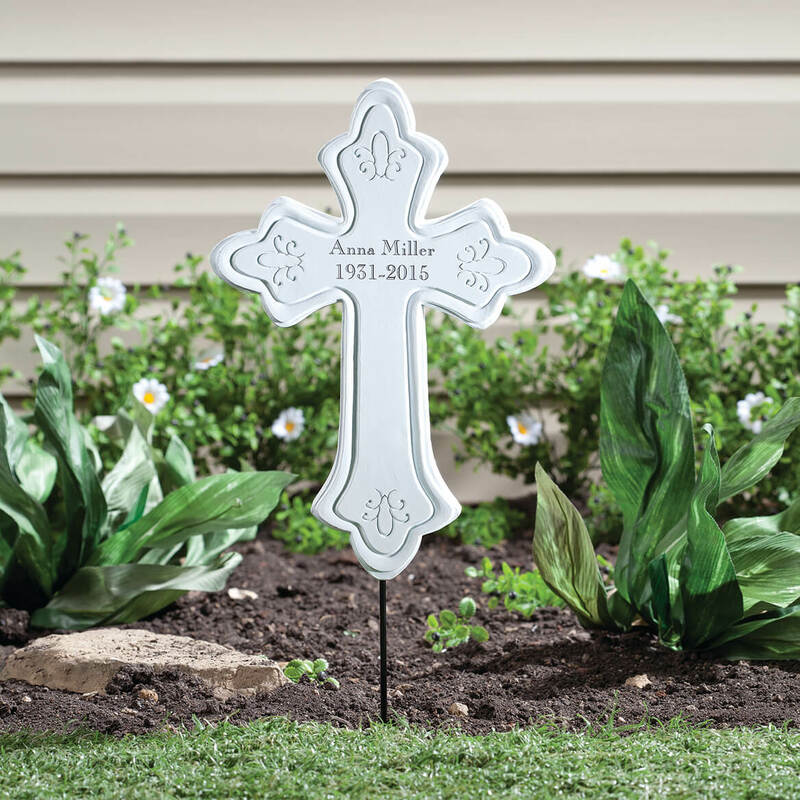 We had one of these personalized memorial cross on his grave for many years. As years go by everything fades. 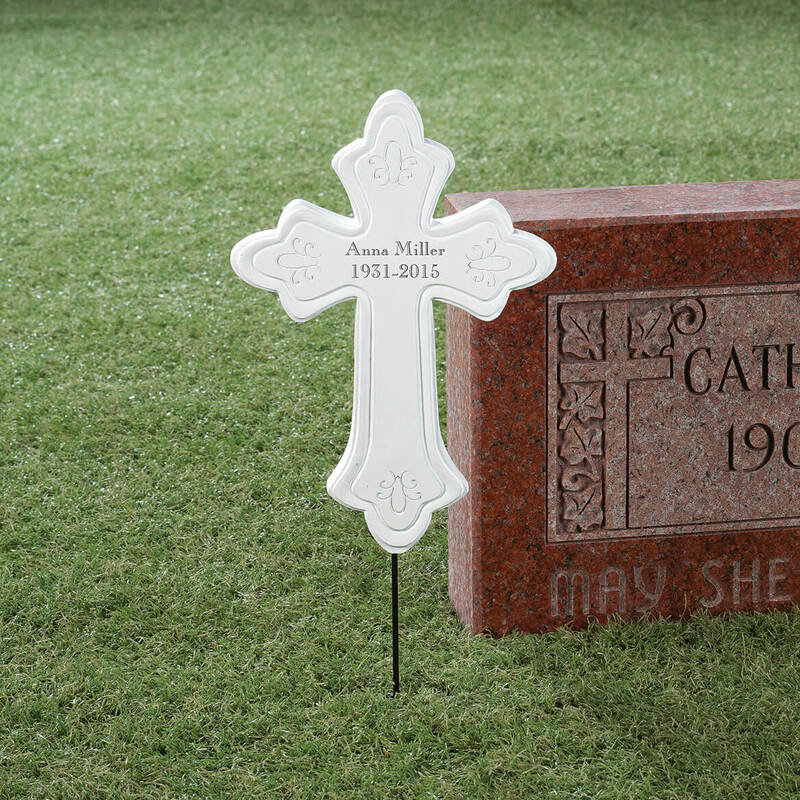 This is just the right size for a small space and makes it easy to find his grave. Very satisfied with this product. It was small enough, sturdy for outdoors and was able to personalize it to my own liking. For my mother.Love the item. How will the writing on the cross stand up to the weather? Longevity? BEST ANSWER: I coated the cross with a coat of sealer,as it was put in the cemetery , but I think it would have stood up fine to the weather . Was very pleased with the quality of the item . It has heald up beautifully. I love it. Its very heavy duty and classy. How high does the cross stand with the metal stakes? The cross is attached to a metal stake that looks like a 3 prong pitch fork. The 3 prongs go into the ground, they are exactly 4 inches long and 3 inches wide. The "handle" portion of the pitch fork is attached to the bottom of the cross. The distance from the bottom of the cross to the "fork" is 4 inches. The cross is 11inches from top to bottom, side to side is 7.5 inches. The cross and "pitchfork" come separate and the cross has a hole at the base where you can screw in the "pitchfork" to mount into the ground. From the top of the cross to the bottom of the pitchfork (tip to tip) is a little under 20 inches. There is a hole In the back of the cross so you can hang it if you choose. The paint is a flat white, it's sturdy but I probably would bring it indoors during the winter to preserve it longer. I would definitely buy again. So far, no regrets. I hope that helps you make your decision !!! BEST ANSWER: Thank you for your question. You can place an order for it at anytime, the item is available. We hope this information will be of help to you. Can I substitute the date for letters? BEST ANSWER: Thank you for your question. As long as you stay with in the maximum characters you can use letters too. We hope this information will be of help to you.